Wondering how to choose the best TV antenna for you? In our detailed guide, learn more about modern HD antennas, and find the perfect one. Range 40 mi. 60 mi. 35 mi. 25 mi. 35 mi. Cord Length 10 ft. 16 ft. 20 ft. 10 ft. 12 ft.
40 mi. 60 mi. 35 mi. 25 mi. 35 mi. 10 ft. 16 ft. 20 ft. 10 ft. 12 ft.
As you can tell, the best antenna for you will heavily depend on your location. If you live close to a TV broadcast tower, you’ll be fine getting an antenna with a lower range. For the Jeremiah Johnsons out there, you’ll need to find an antenna with a stronger signal range. As it stands, there aren’t any 4K signals out there quite yet, but once those surface, the Mohu Releaf is the only 4K-ready antenna we would recommend. With its reliable signal, you’ll be ready to watch your local channels in great HD quality now and with 4K quality in the near future. The Mohu Releaf is an eco-friendly product, made from recycled material. The Mohu Releaf is made entirely from recycled materials like cardboard and even recycled cable boxes (do you sense the irony here?). Is the Mohu Releaf the best HD antenna for you? As is the case with most eco-friendly products, you’re paying a few bucks more than you would for another antenna. Fortunately, the Mohu Releaf still merits the price tag. We picked up every channel in our area, and the picture quality looked great. Factor in the strong range, and you’re looking at a very reliable TV antenna. 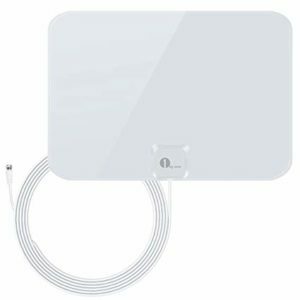 If you’re looking for a basic antenna that works just fine without the bells and whistles, we recommend going with the 1byone Super Thin HDTV antenna. We were able to pick up ABC, CBS, NBC, and FOX in our area with great reception, but other channels like PBS and Univsion didn’t come in as strongly as they did with other antennas. If you mostly just care about getting the core local networks like ABC, CBS, NBC, and FOX, you can definitely make it work with this HD TV antenna. If you want as many channels as possible, you’d probably be better off paying a few extra bucks for the Mohu Releaf. Yes, this particular HD antenna has a slightly weaker signal strength, but there are ways to maximize your reception. If your TV happens to be near a window, then slap that bad boy anywhere near the window for the best reception. No windows in sight? Test the antenna by plugging everything in and raising the antenna on a nearby wall. Once you find the lowest-possible height for the best-possible reception, tack it to the wall and let that be its eternal resting place. What’s the cheapest antenna out there? Just out of curiosity, we tried out the cheapest antenna that exists in the vast library of Amazon antennas. How much does this particular antenna cost, you ask? About $6.90. The first thing you need to know about this inexpensive HD antenna is that the cord is about four feet long. That doesn’t give you much leeway to find the optimal antenna placement. And let’s be honest, with a cheaper antenna like this, placement is everything. If you have a window near your TV or live within 15 miles of a broadcast tower, you can absolutely make this cheaper antenna work. Otherwise, you might need to take a look at one of the other winners on our list. Just because you don’t live in the city near a broadcast tower doesn’t mean you can’t get your local channels like everyone else. You’ll just need something a little stronger. Of all the long-range antennas we checked out, the Mohu Curve 50 was the easiest to set up, gave us the strongest reception, had the most reasonable price, and was just the overall best TV antenna for rural living. We were approximately 50 miles from the nearest broadcast tower, and we caught signals for ABC, CBS, FOX, and NBC as well as PBS, Univision, and a few others. 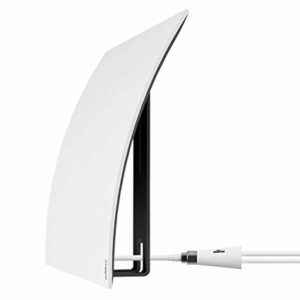 If you’ve done some research on the best outdoor antennas, you’ve probably noticed that the Mohu Curve 50 looks a lot simpler than the others. Other long-range antennas can require roof attachment and precise placement. We just plugged in the Mohu Curve 50, set it up near a window, and we were watching the nearest ABC station almost immediately. You can lay the antenna flat, or you can use the built-in stand—you’ve also got 16 feet of cord to mess around with, so you can easily find the best spot in your house. What if I live more than 50 miles away from a station? If you’re not intimidated by the idea of mounting your antenna to your roof, you can hook yourself up with this antenna’s even stronger signal power. The Sobetter Amplified Outdoor antenna has a 150-mile range, a 33-foot cable, and it’s even 4K-ready (when the technology finally rolls around). It’s pricier than some of the other antennas on this list, but if you time it right, you can get one of the best outdoor antennas for a great price (we’ve seen it up to 75% off). Before you get excited about the Mohu Leaf Metro, double-check that you live within 25 miles of the nearest broadcast tower. If you do, you’re in luck, buddy! We tested the antenna around 18 miles away from the nearest broadcast tower, and we were surprised by how good the picture quality looked for an antenna. No offense to antennas—it’s just that traditionally the picture doesn’t look quite as good as say cable’s or streaming services’. But the Mohu Leaf Metro dismisses that stereotype pretty fast. It’s easily the best antenna for city slickers. If you live close to a broadcast tower, you can get away with a much less expensive antenna than you would otherwise. The Mohu Leaf Metro usually costs less than $20 (prices fluctuate a bit, of course), which is a steal for the quality you’re getting. Also, for all of our interior decorators out there, you’ll have a much easier time finding a place for this antenna than you would for others. 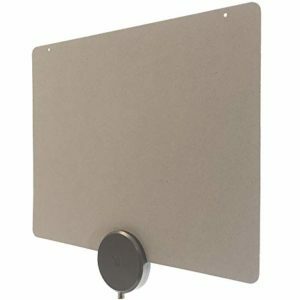 The dimensions are 4×11.5 inches (most other Mohu antennas are about 12×12.5 inches), making the Mohu Leaf Metro one of the smallest antennas we’ve seen. Speaking of small things, the cord you get is only 10 feet in length. You won’t have quite as much leeway to move the antenna around as some other models give you, but thanks to its small size, you shouldn’t struggle to find a good spot. Let’s be honest: a big ol’ antenna slapped against the wall can really mess with the aesthetic of a room. 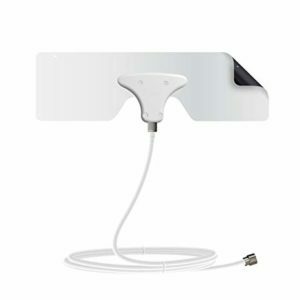 It seems like ClearStream had that in mind when it created the Eclipse Indoor HDTV antenna. One side of the antenna is a creamy white, and the other side is a dark black, so you can choose whatever color works better for your color scheme. The Eclipse HD antenna is also super easy to set up since it comes with built-in adhesives. You just need to stick the antenna in the right place. Size-wise, this HD antenna 8.8×10.2 inches, making it one of the smaller antennas on the market. Signal-wise, it should work fine even hiding behind an entertainment center or a table. Combine those factors with a 12-foot cord, and you should have an easy time incorporating this antenna without hashing your room’s vibe. 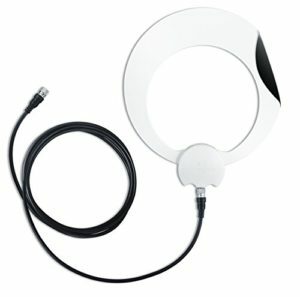 This HD antenna looks good, but does it work well? Yes, the Eclipse Indoor HD antenna works really well. We picked up ABC, CBS, FOX, NBC, and other local channels like Telemundo without any problem at all. This type of quality antenna doesn’t come cheap, though—you’ll be paying around $40 for this bad boy. You can get other antennas for half the price, but they won’t look as good or have as strong a signal. The nice thing about antennas is that they’re a one-time purchase, so paying an extra $10–$20 is probably worth it. Maybe you can confidently live without channels like AMC, ESPN, FX, and TNT—but we certainly can’t. You can get the best of both worlds by signing up for a streaming service and using your antenna to pick up local channels. Because here’s the thing about streaming services—there’s no guarantee you’ll get local channels. Generally, we would recommend going with Sling TV’s Orange channel package. The biggest downside with this channel package is that it doesn’t come with any local channels, (which we don’t need because of the antenna), but it also means the monthly price is only $20 a month. That’s way cheaper than other streaming subscriptions. You can try out Sling TV with a 7-day free trial. Trust us—we spend a lot of time researching how to watch stuff, and we can promise that antennas make watching local channels super easy. No matter what living situation you find yourself in, there’s an antenna for you—a best antenna for cities, a best antenna for rural living, and a best antenna for everything in between. And remember, if you ever run into any problems, you can always return the product to Amazon for a full refund. One day streaming services like Sling TV, PlayStation Vue, and DIRECTV NOW may get local network coverage across the country. In the meantime, it’s a much safer bet to stick with an antenna.